Written by Marcos Gomez, Director of Amnesty International Venezuela. Read the original article on Al Jazeera. The seemingly endless crisis in Venezuela appears to have entered a new, dark and alarming chapter. As if coming off the pages of a terrifying thriller, a crisis that seemed to have reached its worst point in recent months, has actually escalated further after weeks of protests sparked by growing anger and frustration around what looks like a never-ending catalogue of problems. On Monday, President Nicolas Maduro ordered the military onto the streets, two days before planned peaceful protests across the country on 19 April. He said the military would be “marching in defence of morality” and “against those who betray the homeland”. Amid one of the largest demonstrations in recent months, this “call to arms” by the government was disastrous: at least two people died in suspicious circumstances, hundreds more were injured and detained – adding to the more than sixteen deaths reported during protests over recent weeks. Evidence grew that groups of armed vigilantes are taking the law into their own hands. Further demonstrations have been called for the coming days. I thought that living (or surviving) in Venezuela had prepared the population here for anything. The endless strategies to find two kilos of rice, get hold of anticonvulsants or high blood pressure medicine has made us all experts in the art of making do. Now, people also face the utter terror of going out into the streets. Old and young fear stepping out of their homes, participating in peaceful demonstrations, complaining about what it is like to try and survive here. If you do go out and exercise your human right to speak your mind, you might be tear gassed (including from helicopters), beaten, locked up in jail for years without due process or even shot by one of the paramilitary groups that, although unacknowledged by the authorities, are now running amok across Venezuela. Violence by some protesters has been cleverly used by the authorities to justify widespread repression and perpetuate the “us vs them” discourse that has done so much harm to our country. You only need to step outside to breathe this climate of fear. Repression and violence during protests are not new to Venezuela – in 2014, more than 40 people, including at least six members of the security forces, were killed. More than 650 people were injured and more than 2,000 detained. Impunity has been rife. Many, perhaps naively, thought these events were a one-off. We thought the country would learn from its recent history. But over the past few weeks, a cloud of uncertainty and violence has cast a new dark shadow over Venezuela. Day after day, we wake up with news of fresh protests followed by the frightening images of violent confrontations between protesters and security forces. Since this new wave of demonstrations began on April 4, tensions have escalated daily. People looked like they had nothing to lose. Many of them don’t. What began as ordinary protests against the political and humanitarian situation in the country and against the – since-overturned – supreme court’s ruling to “ban” the National Assembly, quickly turned into something else, something much more worrying. By the third day, we found ourselves giving shelter to injured demonstrators in the hall of the building where I live, my family and I giving first aid to bruised and battered men and women, frustrated and exhausted by the realities of daily life in Venezuela. This contrasted starkly with the reality on the ground – in just over a fortnight, at least seven people died during the protests and hundreds were injured. A few days after the initial wave of protests, the Venezuelan Public Ministry announced an investigation to find those responsible for the killings. But this effort towards justice and accountability must not be just for show. Instead, it must be a genuine commitment to the full respect and protection of human rights, one where those who think differently from the government are not portrayed as enemies and where those who violate human rights are brought to justice. The tragic contrast between the Venezuela portrayed by the authorities and the one we live in is so deep it’s hard to explain. The country President Maduro speaks about is at peace. People are handed food donations from government-sponsored trucks. Children happily study in school, none of them fainting in class because they have nothing to eat at home. Hospitals are fully stocked, providing their patients with the best care available. But this is mere fiction – following in the celebrated Latin American tradition of magical realism. In contrast, the Venezuela I – and millions of others – wake up to every day is a real-life labyrinth where buying the most essential items has become a nearly impossible struggle. “How do people in Venezuela survive?” many ask me. I still have not been able to find an answer. But one thing is certain. The Venezuelan authorities’ “see no evil, hear no evil” attitude to the crisis does not cut it anymore. Hiding behind a veil of propaganda and playing victim to some shadowy international plan to destabilise the country is not helping anyone in Venezuela to eat and stay healthy. The time has come for all state institutions to fulfil their duties and work on behalf of all the people in the country. How much longer we can go on like this is anybody’s guess, but the fact remains that something can, and must, be done to prevent our country from falling into an abyss with no return. Marcos Gomez is the director of Amnesty International Venezuela. Written by Sinan Ekim and Kemal Kirişci. Read the original article on Brookings.edu. This Sunday, the Turkish electorate will vote in a nationwide referendum on several proposed amendments to the constitution. This is Turkey’s seventh constitutional referendum since its transition from single-party rule to a multi-party system in 1946. The current constitution, which went into force in 1982, has already been amended three times by popular vote and 15 times through legislative action in the past 34 years. After decades of amendments, 117 out of the 177 articles no longer stand in their original forms. The current package that will be put to a vote contains 18 measures that will further revise or repeal 76 articles. It is difficult to neatly categorize the proposed amendments, but below we group them into clusters, indicating how they will impact the functioning of the executive, legislative, and judicial branches, as well as democratic governance. What seems consistent across the board is that the amendments package has been prepared with current president Recep Tayyip Erdoğan in mind. Considering that both the Justice and Development Party (AKP) and Erdoğan are likely to continue to win the popular vote, the changes would institutionalize a populist, one-man system that jeopardizes legislative and judicial independence and consolidates them in the office of the president. Indeed, the dramatic changes proposed would set in motion the most drastic shake-up of the country’s politics and system of governance in its 94-year-long history. Indeed, as written in The Washington Post, Turkey would never be the same again if this is passed. The duties of the prime minister would be subsumed under the office of the president, and the prime ministry would be abolished, transforming the parliamentary system into a presidential one. Unlike under the current system, the president would not have to be neutral—above politics and representing the whole nation (article 7, amending article 101). The president would also be able to issue decrees on political, social, and economic issues that would carry the force of law (article 8, amending article 104). These three measures would accord substantial powers to the president, as the president would assume the powers of both the head of government and head of state, and the legislature could therefore become a rubber stamp on the executive. However, there are a couple of loopholes that could derail this process. First of all, there would be limits on the scope of presidential decrees: they could not contradict the fundamental and civil rights and responsibilities enshrined in the constitution (articles 12, 13 and section IV). Furthermore, the president could not overturn existing laws or decree a law in an issue-area where law by the parliament is required. If a decree contradicts the law, the law takes precedence, and the parliament could pass laws that override presidential decrees. It may seem as if the legislature could then function as a restraining mechanism on the president; yet, it all depends on its composition. A parliamentary session requires 1/3 of its members to be present to make decisions, and needs an absolute majority (50 percent + 1) of the members present to vote in favor of a decision (article 96). This means that, if the president’s party controls a critical number of seats, the legislature could indeed become a rubber stamp. If the president’s party does not have an absolute majority, however, the parliament could technically be in a position to overturn the president’s decree. The general assumption is that, for the foreseeable future, the AKP would be able to secure an absolute majority—meaning that the legislature would likely not move to contradict the executive anyway. Moreover, under the proposed system, the president could dissolve the parliament, but with an interesting twist: Since presidential and general elections would be held every five years and simultaneously (article 4, amending Article 77), the dissolution of the parliament would then technically mean the dissolution of the presidency. The parliament could either be dissolved by itself (with a 3/5 majority) or by the president (article 11, amending article 116). If the parliament moved forward on such a decision in the president’s second term, the incumbent could win a third mandate. If the package passes, the new system will enter into force in 2019, when the parliament’s current term has ended. Erdoğan would then be able to stay at the helm until 2029, assuming he continues to win the popular vote, and if the parliament called for snap elections towards the end of his second term, his presidency could be extended until 2034. In that event, the current president would have been in power for more than three decades, a first in Turkish republican history. If the president himself called for new elections in his second term, by contrast, he would not be able to serve a third term in office. Another proposed amendment would allow the president to appoint one or multiple vice presidents—an office that does not exist under the 1982 constitution (article 10, amending article 106). The president would also have the power to establish and/or abolish ministries, appoint ministers and other senior officials—all of whom would operate without being subject to any legislative or judicial review, and would be accountable only to the president. The parliament’s traditional function as a check-and-balance mechanism on the executive would be reduced. It would no longer be tasked with overseeing the council of ministers (article 5, amending article 87). Members’ of parliament right to submit oral and written questions as a part of their auditing process would also be amended—with the MPs only allowed to put forward “written submission” (article 6, amending article 98) to the vice-presidents and the ministers, and not to the president. These would elevate the president above legislative scrutiny—a major and dramatic break from past practice. Another change is that the parliament would need an absolute majority of its entire membership (50 percent + 1) to re-pass a bill that the president sent back to the parliament for reconsideration, whereas the current constitution allows the parliament to bypass the president’s objections by a simple majority of a quorum (article 16/C, amending article 89). This would diminish the body’s decisionmaking capacity, making it more difficult to move in a direction that is not sanctioned by the president. The process of impeachment would also be conducted differently. The parliament could petition for an investigation into an alleged crime with an absolute majority; it would then need 3/5 backing to move forward with such a petition, instead of a simple majority. A 15-member commission would then be appointed to produce a report, which would need a 2/3 majority to be sent to the supreme court for a final review (article 9, amending article 105). As such, it would become much more cumbersome to take actions against the president. Under the current system, the president appoints four of the 22 members of the High Council of Judges and Prosecutors, a body responsible for appointing new judges and prosecutors as well as overseeing promotions. The revised system (article 14, amending article 159) would reduce the overall number to 13, and still require the president to appoint four members, while the parliament would appoint the remaining seven. These 11 members would be joined by the minister of justice and the minister’s deputy; since the amendment package also allows the president to handpick his ministers, six members of the Council would be basically presidential appointees. The 17 members of the Constitutional Court would be reduced to 15 (article 16/D, amending Article 146/1). Otherwise, the composition of the court would remain the same, with 12 of its members being appointed by the president and three of them by parliament. The parliament would select its appointees to these two bodies in two rounds, with the higher bar for the former requiring 3/5 majority and the latter an absolute majority of the total number of MPs. If the new system were to pass, therefore, the president would select 18 of the 28 top-ranking members of the judiciary. If the president’s party at least has a 3/5 majority in parliament, the judiciary may then be entirely aligned with the executive—or, effectively, the president himself. Undoubtedly, this would put a huge question mark on the independence of the judiciary, as it would not be subject to a parliamentary review process and report only to the president. The latest opinion polls suggest a neck-and-neck race. In an overview of 28 surveys, 12 of them predict a victory for “yes,” while eight suggest the “no” camp will win. There is also the question of undecided voters. Some suggest that they actually oppose the package, but are unwilling to openly say so because of the oppressive environment in Turkey today. Indeed, as reported in Turkish and Western media, there are mounting concerns over how fair the vote will really be: intimidation against the “no” campaign runs rampant, and with scores of journalists in jail, media has now come effectively under the government’s control, not to mention concerns regarding fraud at the ballot box. Surveys do not always provide an accurate indication of what will unfurl on voting day. Yet, what is certain is that Turks will be voting in a referendum that will have more impact on their country’s future trajectory than any of the preceding referendums. If this series of amendments passes on April 16, it will institutionalize a version of an executive presidency—now billed as executive presidency alla turca—that will accord the president more powers and more independence from the check-and-balance mechanisms than any other Turkish leader since 1946. Written by Laura Hughes, Political Correspondent for The Daily Telegraph. Read the original article on The Daily Telegraph. A meeting of G-7 foreign ministers are discussing new sanctions on Syrian and Russian military figures, Boris Johnson has confirmed. 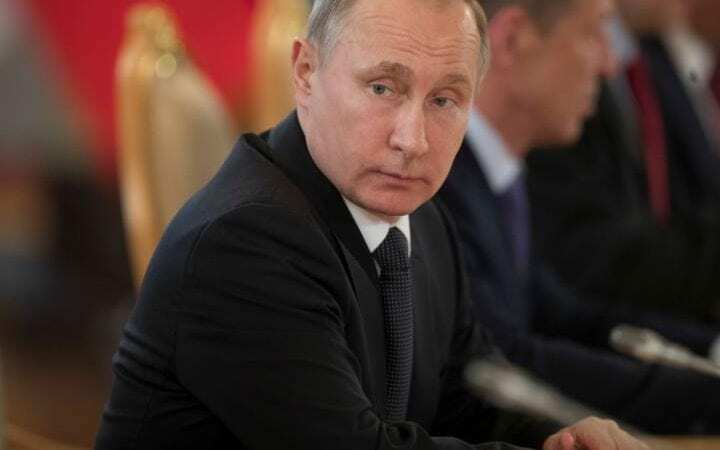 The Foreign Secretary said the “game has changed” ahead of a meeting with his counterparts in Italy, where ministers will demand that Vladimir Putin remove his troops from Syria and drop his backing for the Syrian president. 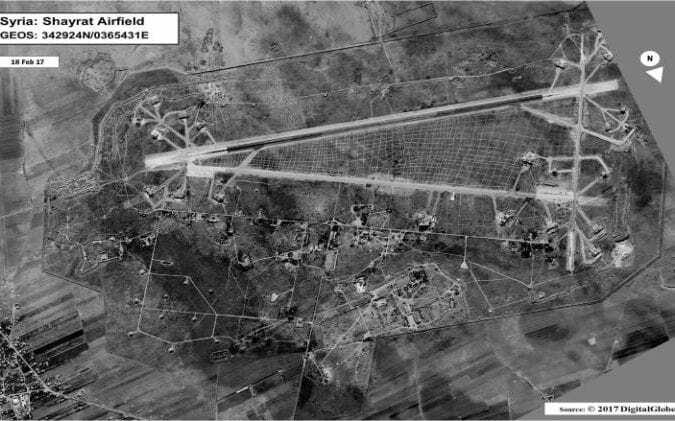 The attack was authorised after 87 people, including children, were killed in a suspected sarin nerve agent strike on Khan Sheikhoun. Speaking outside the summit, Mr Johnson said: The United States have already imposed some extra sanctions themselves, and we will be discussing the possibility of further sanctions certainly on some of the Syrian military figures and indeed on some of the Russian military figures who have been involved in coordinating the Syrian military efforts and of course who are thereby contaminated by the appalling behaviour of the Assad regime. Asked why he believed sanctions would now work , he told reporters: “I think the Russians need a way out and a way forward and if I think about the position of Vladimir Putin now he is toxifying the reputation of Russia by his continual association with a guy who has flagrantly poisoned his own people, and I think the world can see this. “The evidence by the way is overwhelming, he should look at the evidence for what happened the other day. Discussing America’s response to the attack, something described by Assad’s allies as having crossed a “red line”, Mr Johnson suggested that the US could launch fresh strikes in the fight to weaken President Bashar Assad’s regime. He told The Sun: “Crucially – they could do so again. Theresa May spoke to Justin Trudeau, the Canadian Prime Minister, on Sunday night and said that Russia must help secure a “political settlement” in Syria. A Downing Street spokesman said: “They spoke to discuss events in Syria following the chemical weapons attacks. 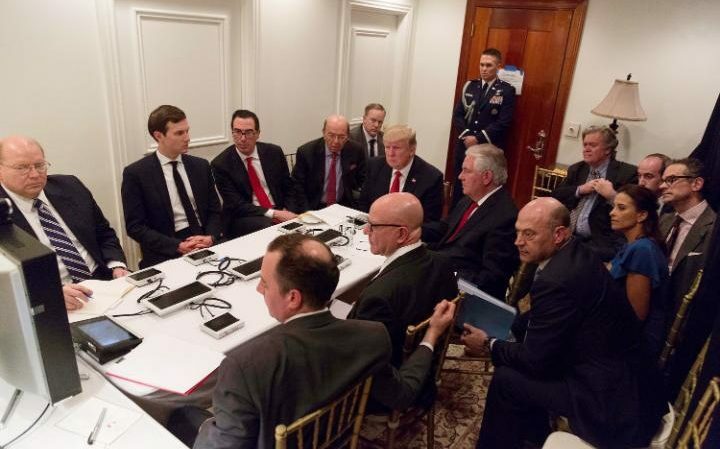 They agreed on their support for the US action, that it was an appropriate response to the barbaric chemical weapons attack launched by the Syria regime. “They discussed the importance of Russia using its influence to bring about a political settlement in Syria and to work with the international community to ensure that the shocking events of last week are never repeated. 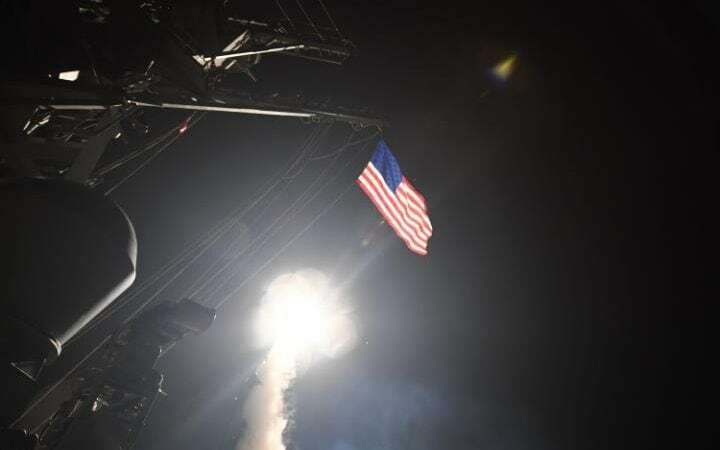 Both Russia and Iran have threatened military retaliation against the US, accusing Mr Trump of crossing “red lines” by ordering a cruise missile attack on a Syrian air base. 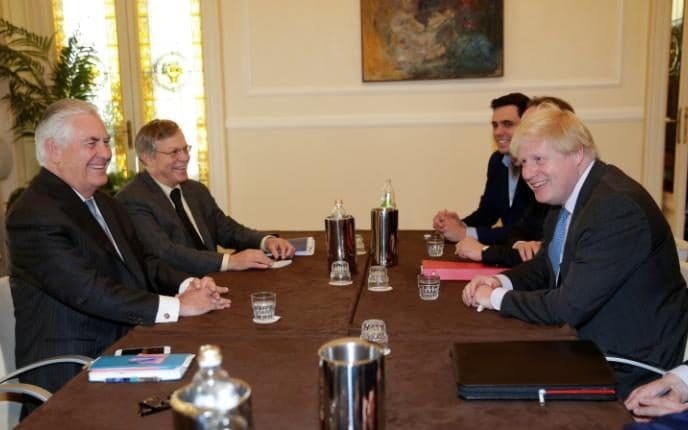 Mr Johnson is understood to be working on a proposal from the G7 group of nations which will demand that Mr Putin withdraws his support of Assad. Mr Johnson cancelled plans to visit Moscow this week to work on the proposal – which The Daily Telegraph understands will include a tacit offer to Russia to rejoin the G7 if it complies. On Sunday Russia mocked Mr Johnson, saying his refusal to visit was “deplorable” and, in a series of jibes on Twitter, questioned whether he would make a fit wartime lieutenant to the American president. 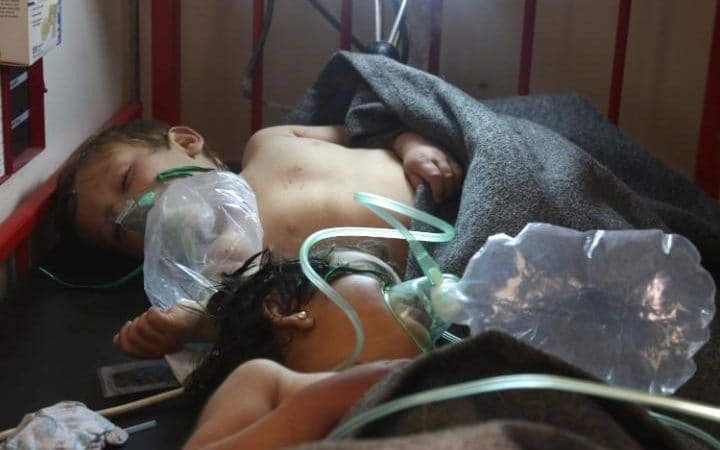 Sir Michael Fallon, the Defence Secretary, warned Russia it is responsible for the deaths caused by the Syrian chemical weapons attack “by proxy”. Rex Tillerson, US secretary of state, echoed the comments, telling Face The Nation on CBS, the Russians “have played now for some time the role of providing cover for Bashar Assad’s behaviour”. He also said on Monday that America was ready to take action to defend innocent people. “We want to be with those who know how to respond to those hurting innocent people in any part of the world,” he said at a memorial for the 560 victims of a Nazi World War II massacre in the Tuscan town of Sant’Anna di Stazzema. Former head of MI6 Sir John Sawers supported the intervention in Syria but expressed serious concerns about Mr Trump’s ability to manage the complex diplomatic challenges in the Middle East and North Korea. Asked if he was scared of Mr Trump, the former diplomat and spymaster said: “He is not someone who fills me with confidence. He doesn’t have the background and the experience and the instincts of being an effective US president. “But it is in our interests that we have a US administration which upholds the international system, that supports its allies and supports international norms.” He said the last week had shown “sensible grown-ups within the administration taking charge and the rather ideological figures around Trump himself being marginalised”.